Math: Today we reviewed what are skeletons, how to build them and how to count the edges and vertices of the skeleton. They built their own shapes from skeletons in groups and completed a worksheet. 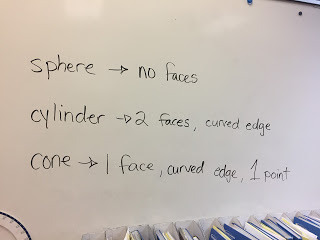 Math: We continued working on math. Spelling Test: Tests will be handed back next week.